This approach offers a relatively simple and flexible way to create automated dashboards, and makes it easy to update and expand which data is tracked as KPIs change. Let's walk through a scenario where this would be useful. Suppose your team has recently released an open-source project on GitHub. You want to track a few KPIs: stargazers, subscribers, and open issues. These will give you insight into the popularity of the repository and how well you are resolving issues that come up. You want to create a dashboard to track these KPIs and provide visual insight on the progress for each KPI. Make the information easy to consume. Keep the data up to date without tedious data entry. Not long ago, my teammate addressed the first issue with a great post on How to Make a Killer Data Dashboard With Google Sheets. This week, we'll dive into keeping the dashboard up-to-date automatically with a Google Apps Script. Save a copy of the final spreadsheet for reference. Note: The data before Dec. 13, 2017 is simulated data. The response of this request includes the number of stargazers, subscribers, open issues, and much more information that could be tracked. For this post, we'll only focus on these three KPIs for two repositories from the user lucidsoftware: xtract and relate. To get started, let's create a rudimentary function to send a request to GitHub's API. Here is a simple snippet of code that accesses GitHub's API, gets the number of stargazers for xtract, and puts the value in cell A2. We will expand this snippet of code as we go. We can now get data from GitHub! This is great, but not very useful. Now, modify the script to add a row each time the updateGithubSheet method is called and put a date in the first column. Although this script is slightly more useful, it is not very versatile. Just as a good developer creates reusable code, a good spreadsheet-maker creates reusable spreadsheets. One way to improve our script and sheet is to define the user, repository name, and fields of interest in the sheet itself using the Template Sheet Pattern. The Template Sheet provides information for the script to process in locations determined by a contract. The script updates the Template Sheet as determined by a contract. The concepts in this pattern are very simple but allow for reusing code and spreadsheets in a powerful way. We'll revisit this after discussing the contract used in this tutorial. Have the Github Username in field B2. Have the Github Repository in field B3. Have row 4 starting at column B contain the Field Names in the response JSON. The Field Names terminate on the first column with an empty row 4. Add one row after the last row on the sheet. The new row will have the timestamp in column 1 followed by the Field Values corresponding to the Field Names from row 4. An example spreadsheet meeting the contract of the GITHUB key. As you can see, adding a fourth KPI (such as forks) requires adding only one field at cell E4. Similarly, tracking a new repository requires only creating a new sheet that matches this template with a different repository name. Establishing this contract makes tracking new KPIs very easy. Before developing code to meet the contract, create a simple method to scan sheets for known contracts. The following method routes all sheets with the GITHUB key to the updateGithubSheet method. If you create additional contracts, you can also route them in this method. We can now modify the updateGithubSheet method to meet the GITHUB contract. First, dynamically create the rest URL based on the provided Template Sheet. Second, create a method to get all of the Field Names from row 4 as specified in the contract. Here, we rely heavily on the contract and stop checking columns once we find a blank cell. This could be more robust, but for the purpose of the tutorial, we will require strict adherence to the contract. Finally, update the method to add an array of Field Values to the Template Sheet corresponding with the specified Field Names. Note: This contract only allows you to access elements of the JSON at the root level. You could easily create a contract that would dig down multiple levels and follow REST links in the response. This contract is very basic. Now, running the updateGithubSheet method will update all Template Sheets in the document with the GITHUB key. An example of two Template Sheets updated that match the GITHUB contract. This pattern allows for a flexible and reusable way to gather data and requires little work when new fields or sources need to be tracked. Automating the script requires a trigger to fire on a recurring basis. To create a trigger, select this button from the Script Editor toolbar and create a time-driven trigger: For this example, use a daily trigger on the updateAllSpreadsheets method. When setting these triggers, be aware of API rate limits — if you set the trigger to run too often (usually on the scale of minutes), it can exceed these rate limits. Now that we have an automatically updating dataset, the next step is to format the data. An important principle with spreadsheets is to keep the logic and data separate. In line with this principle, we will create a Summary tab to format the data for display. 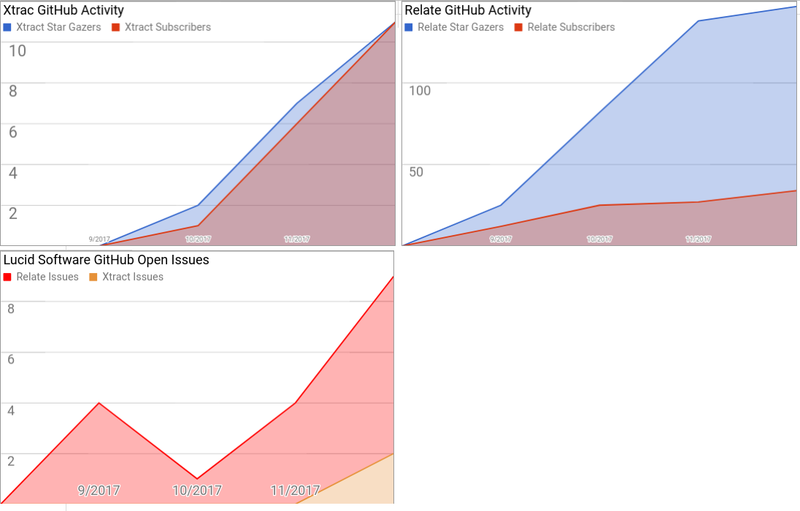 Although we are gathering data from GitHub on a daily basis, it may be more useful to display the data on a monthly basis. We'll create a formula on the Summary page to get the last data point each month and use that data to create a dashboard (you could also do an average or other methods for aggregating the data). The following formula shows one way to aggregate this data (alternatively, you can use Google's query function instead of a formula). This formula has two major parts. The expression inside MAX works by finding an array containing the row number in the xtract sheet where the date corresponding with the row is between the first day of the month and the first day of the next month. The xtract SUBSCRIBERS value in the row corresponding to the maximum value in this array is displayed. If there are no values in the date range, the IF statement is processed, which will show 0 or "empty" where appropriate. Finally, create the dashboards from the formatted data. See How to Make a Killer Data Dashboard with Google Sheets for tips and tricks. The following dashboard was created using these principles. The open issues data from this tutorial is shown in a stacked area chart. This is useful because it shows how many total issues needed to be resolved across both repositories. Visualizing the stargazers and subscribers as non-stacked area charts helps show both the number and proportions of these values. Example of a dashboard that updates automatically to track the KPIs for the relate and xtract repositories. This approach offers a relatively simple and flexible way to create automated dashboards. It requires an initial investment in creating and implementing a contract but makes it very easy to update and expand which data is tracked as KPIs change. Published at DZone with permission of Joe Stack , DZone MVB. See the original article here.